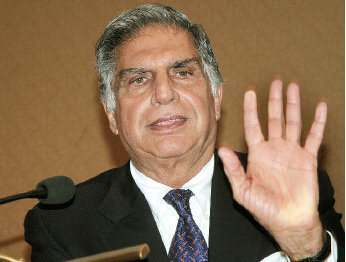 Ratan Tata, who is presently the chairman of the Tata Group, has always been somewhat of an enigma. Very little is known about Ratan Tata the real person. His hands tell us that while he has some very good qualities, there is something about his personality that would make him a difficult man to live with on a daily basis. is shown by his Apollo finger. It is long and curved, longer than normal. This shows a high risk-taking ability, and is a sign of a speculator, of a person who has a well developed money-making talent. 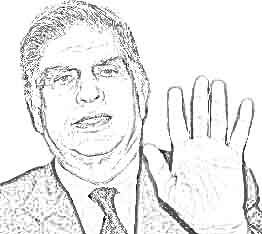 In addition, Ratan Tata has a very long Mercury (little) finger, good second phalanges, curved Jupiter (index) finger and developed Moon, especially upper Moon. The mount of Venus is developed to some extent and he has a good Heartline. The thumb is held close to the hand. Some of the above mentioned hand features collaborate his business and entrepreneurial streak. Check out photos of his hand here and here. His talent for making money and speculative abilities, which were good to begin with, have been developed and honed to a high degree, much higher than what he was born with, and this can be seen by comparing his right (passive) and left (active) hands. Prudence and caution has also increased. In fact he has become far more prudent when it comes to his actions than when he was a young man. 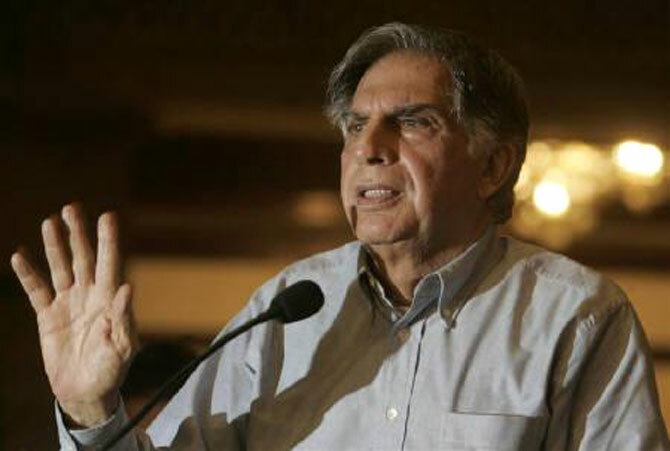 However much of a shrewd businessman he is, Ratan Tata enjoys power more than money. He has always had a strong ambition to lead, gain power, and his mind is always on the go, always thinking up some deal or scheme which will add to his empire. He likes control, and tends to be arrogant, even vain. His hand shows that he had these qualities even when he was younger. He can be tactful and very persuasive but also likes total control. If he doesn't get his way, he can become argumentative and aggressive. He does have softening qualities. His high intelligence as shown by Headline as well as the shape of his thumb tells us that Ratan Tata can be influenced, and does listen to others if approached in the right manner. He has the ability to listen to another's point of view. But what is the method to get one’s way with him? It's simple. The right way! Principles and ideals are a strong part of his personality, although two of his fingers have square tips and the shape of his hand is squarish. This reveals his practical nature. He also has a compassionate side, and will always be guided by the intention to do good to the flock he leads. He may love to rule, but he will be a warm and just leader. There has been some speculation about Ratan Tata's sexual orientation and a reader has written to me asking me whether I can tell of a tendency to be gay from a hand. Well, sexual orientation by itself cannot be told from a hand, but sexual passion and interest can be, whether heterosexual or homosexual in nature. Ratan Tata has that in normal amounts. Sensualism is present in a stronger degree. The reason one knows so little about his personal life is that Tata is rather secretive and closed, about his personal life and can be difficult to approach at a personal level. If one has to conclude one could say that even though his character may not be perfectly balanced, mainly because of his tendency to be controlling, these qualities must have been beneficial to him as a business leader. Or read about Gay Celebrity hands. Or check out the hand readings of Businesspeople from around the world: Bill Gates or Warren Buffet's hand reading or Steve Jobs' hands tell us about his inner self or Julian Assange's hands reveal that he is not a predator! A very well written analysis.It tallies with what I have known of him professionally. vishesh, thats true, one cannot help but be interested in these people, and what it is that has made them successful. For me it is quite a thrill to discover them through their hands. Harsh, no, the slight bent in the finger has nothing to do with the confidence level of the person. However it can show arrogance but not always. In his case it does, in combination with other signs.